Hi friends! 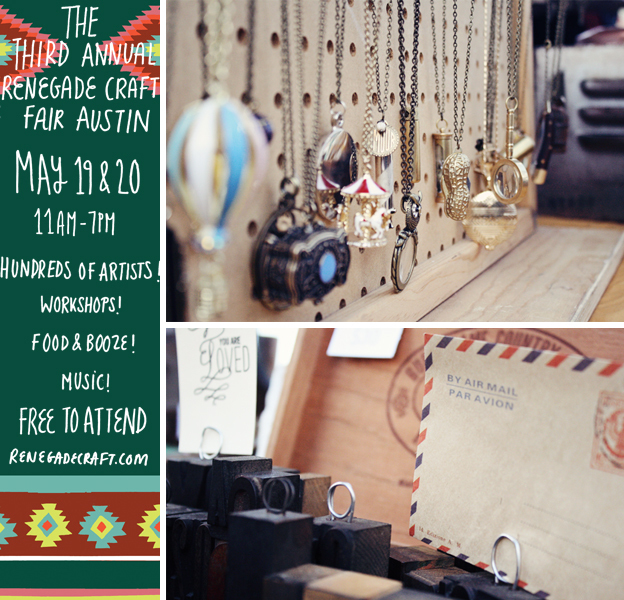 I'm taking off a day early because we're headed to Austin tomorrow for Renegade Craft! So excited to visit the city, I've never been. Any recommendations for things to do in Austin? I hear it's a lot like Portland and I pretty much love Portland with all my heart so I think I may love Austin too... minus the fact that it doesn't rain as much ;) My only experience with Texas was driving with a friend from California to Waco and driving w/another friend from Minneapolis to McAllen, 5 minutes from the border, haha. So all I've done is driven through Texas, I am so excited to actually visit. Hope you'll stop by and say hello if you're in the area! oh, hello friend will also be at Patchwork Long Beach this Sunday as well, so stop by and say hello to my lovely ladies who are helping out with shows - Tesia & Sunny, they are awesome! i just visited austin for the first time this spring and fell in love! shopping/walking all along south congress is just perfect. have the best time! xo. Have so much fun! Austin sounds like a great place and I'm sure they'll fall in love with your goods. I would tell you to hit up a Texas Longhorns game, but it isn't football season. Even if you don't like football, it's kind of what the entire state is about so it would be quite the experience! Maybe check out UT, I hear it's awesome! I'm so excited to see you there! If you have the chance, I would recommend kayaking at Zilker Park, amazing cupcakes and sweets from Sugar Mama's Bakery, and a great cup of coffee at Summermoon. Have fun! Never been to Austin, but craft fairs are always a blast! A lot of work, but a lot of fun! Make sure to check out the Congress Bridge bats, the shops on South Congress, and if you get a chance drive around the hill country (prettiest part of Texas). Oh! and visit an Alamo Drafthouse. There are lots of cute boutiques along South Congress, yes. Also, Guadalupe St. near UT is wonderful. My favorite places during nice weather are the Spider House Cafe and Motzart's Cafe. Great for outdoor sittin and talkin and sippin. <3 I am originally from Amarillo TX, but I've spent lots of time in Austin. I love Austin! But I'm from Orange County, so I know both sides of your situation :) I live in the Northwest area, but there are alot of things to do downtown... the Zilker botanical gardens are beautiful, kayaking/canoeing down Ladybird lake is fun, the Capitol building is gorgeous, there are a lot of good shops on Congress, and of course there is always live music all over the place. I have to admit though, people watching is definitely my favorite activity downtown... my friends and I always have a contest to see who can find the craziest hair and tattoo. I hope you enjoy it! I will for sure try to stop by the fair! i want to go to there. so close but so far away [waco]. seriously, why does it have to be so exhausting go out of town every weekend? i'm too young to want to stay at home! you will enjoy austin. every restaurant is the best restaurant. awww have soo much fun! wish i could go!! Austin is my favorite city!! And of course you should check out some food trucks. Can't miss those in Austin. South Congress....food trucks and Jo's Coffee. You have to dine at The Oasis. I went 2 weeks ago and loved it! just stumbling across your blog... those necklaces look lovely. have fun at the craft fair! i've only been to austin once, but i do recommend a hole-in-the-wall tex-mex place called el caribe. sooo good! I've lived in Austin almost my whole life! You should go to Kerbey Lane for at least one meal (they have the best pancakes and their other food is really good too) and you should try to go to Franklin's. It's a delicious b-b-q place, but you have to get there at 11 because they close when they run out of meat everyday. Also, try to get Tex-Mex. You must eat it while in Texas :) One other food place would be Amy's. It's an ice cream shop and very "Austiny." As far as places, you should go to Zilker Park, Town Lake, and the capitol building! Austin is a very fun, outdoorsy town. Be prepared for heat though, today it was in the 90s! I can't wait to hear about your trip! I saw your photos on twitter.